Magnificent start of the spring running season is happening in the East of Slovakia. During fourth year Košice Runway Run reports more than a 1300 registrations while there is less than two weeks until the run. Every registered runner receives a TRIPEX voucher worth 35 EUROS for any online tickets departing from Kosice to any destination in the world via www.tripex.sk. Košice is the only city in Slovakia where the night runners can run on the airport runway thanks to Radio Košice. If you want an unconventional, but also a good track, sign up today, the number of runners is limited. KOŠICE RUNWAY RUN HAS ALREADY REGISTERED 1000 REGISTRATIONS! Towards the end of April, hundreds of runners will be on the Košice runway enjoying a quality track from a different perspective than just by boarding a regular plane. April 27, 2019 is the date that transforms the runway of Košice Airport into a running track, the fourth year of a unique run is slowly approaching. KOŠICE RUNWAY RUN has already signed up 1 000 registrations, confirming the growing interest and uniqueness of the event. Marián Stevlík from Banská Bystrica became 1000th registered runner. If you want to join sports lovers, hurry up not only to the finishing line but also for the registration - the number of runners is limited. Registration is still possible online. The illuminated track of the landing and take-off runway of Košice airport is being prepared for hundreds of runners. 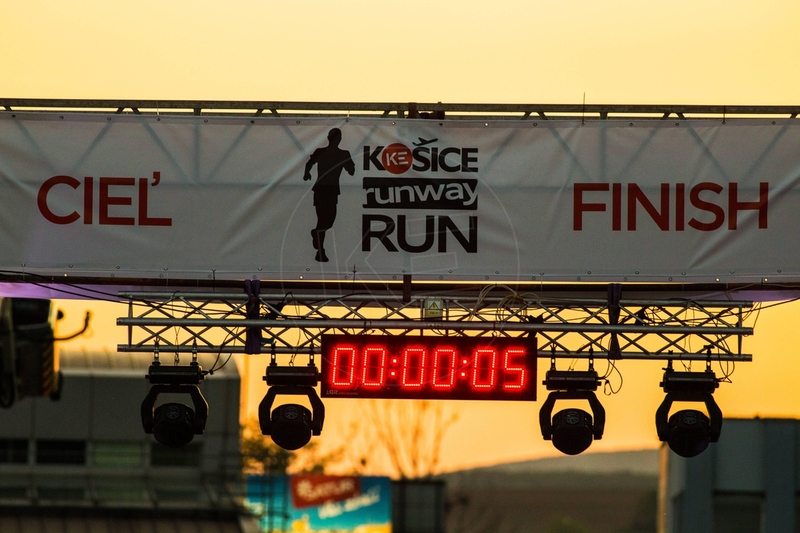 KOŠICE RUNWAY RUN 2019 will start the running season in a big style. April 27, 2019 is going to belong to sport, music and, we also believe, to a new record. A medal is yet again ready for every runner – furthermore in 2019 it will be again in a new design. After reaching the finishing line, every single runner receives a medal, regardless of the time and position on the scoreboard. Registration is still running on runwayrun.sk don't hesitate to join hundreds of registered runners. Hundreds of runners will be back on track on April 27 to reach places that are not normally accessible due to security restrictions. The 4th year of KOŠICE RUNWAY RUN has already recorded almost 700 registrations, thus confirming the growing interest of runners. Also this year a technical shirt in a unique design is ready for each registered runner. Join us too, take an advantage of the online registration available until 27/04/2019 or until the capacity of the event is fulfilled. KOŠICE RUNWAY RUN is a combination of night running and a unique running track. Experience the joy from running and the unique atmosphere of running at Košice Airport. Košice Runway Run is an ideal combination of sport, entertainment and tracks that we would not find in any other parts of Slovakia. The exclusivity that belongs to Košice slowly becomes a tradition that you should also be a part of. There is a choice of track length; each runner has a chance to make his own choice based on his capabilities. The contenders will step on the Košice Airport runway on the evening of 27.04.2019. Hundreds of runners used the unconventional landing and take-off runway last year, there will also be an attractive program in front of the airport terminal for all fans that will not be able to make it to the runway due to security restrictions. Only registered runners have entry access. Here is the first year of a unique running event – KOŠICE RUNWAY RUN 2019 – evening run directly on the Košice airport runway. Registration has started, log online today - the number of runners is limited, given the specificity of the event! Perfect weather, great organization and excellent performances have created a unique atmosphere. Night runs simply belong to Košice area, the result is also a run on a runway of Košice airport. Nearly 1,600 runners registered for the start of the prestigious run on the take-off and landing runway, which is more than last year. The runners has started the spring season in the last weekend of April. The runners "were flying" on 5 and 10 km long tracks and enjoyed it extremely. The only run of this kind in Slovakia opened for the third time in the area that is not normally accessible to the public. We will meet at Košice airport on Saturday, prepare a starting number and good running shoes instead of the airticket. The Spring Running Season begins, in the East of Slovakia it officially kicks off with the prestigious KOŠICE RUNWAY RUN 2018. This Saturday, April 28th, hundreds of runners and sports lovers will meet at the runway of Košice Airport. Košice is the first and only city in Slovakia with the opportunity to run directly on the airport's runway, thanks to the author of this idea - Radio Košice. Hundreds of runners will enjoy running RUNWAY RUN KOŠICE, as well as an unconventionally illuminated track, and a lot of fun which would come with it. All this Saturday - April 28, 2018 on the Košice Airport runway. Košice Airport will open its gates to all registered runners, who will be able to warm up properly just before the run, but the BUBONZ drum or a specially illuminated track will also guarantee a better performance. There is an interesting program also prepared for all visitors, supporters and spectators. If you want to join the sport lovers, do not rush only to the finish line but also with the registration - the number of runners is limited. Registration is still possible online or in person at the presentation point.